Can Trump End Family Court Corruption? Trump rally in Albany, New York. Our report of court corruption and reform was hand delivered to campaign staff. Is there any one out there who will take solid steps to end the abuse of parents in America’s divorce and family courts? Among the presidential candidates we all know the answer, and that’s Donald Trump. How many parents can truly say they got a fair shake in these courts? While the scandals, bribes and misconduct become exposed, the corruption is only escalating. And most of it is overlooked unlike other branches of government. It’s up to us to reform this system, to replace mandatory custody awards with a shared parenting framework, to rein in over-billing lawyers who profit from needless orchestrated court battles, and take back our courts. 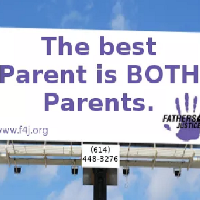 Fighting to preserve Parent–Child relationships to improve the lives of children and strengthen society by protecting the child’s right to BOTH Parents! We’ve had enough. It’s time for a war on court corruption. Please share this post, promote it and kindly make a donation for a most worthy cause. We also offer a court program to help parents avoid injustices in these courts at www.ParentingRightsInstitute.com. An Urgent Call to Action: Let’s Make America Great Again! It is time to put Family Court back on the Political Agenda. Your children and future generations are counting on you to take action now! Hunger Protest ~ To be part of children’s lives. If Trump decided to tackle the family court system this factor will make America great again, more than any other factors. This site is confusing. In 90% of the cases if the father challenges mother for custody the father wins. This is a business to make money. The judiary system including many of the lawyers and other family court system employees profit at the expense of children’s well being. Robbing them of fear free childhood and putting parents into financial and emotional ruin. I know I went through it in NC. My child is now grown. The feudal justice system in NC and other states just keeps growing! To the consternation of my friends I have been a staunch Trump supporter – changing my registration to Republican in order to vote for him. So long as he is willing to examine this issue from both the perspective of moms and dads and CHILDREN this could be fantastic. But it will be a test of Trump’s analytical skills to as well as his humanity if he reads through all the evidence that will no be provided to him . His opportunity to prove that he CAN make America great again. Moms please get your materials together. This is exactly what WE should have done. Authors can you get all of your books together and hand deliver to campaign staff a full shelf of first hand stories. Judicial Watch, please, PLEASE provide the files you have on this issue. In case I were the one having to write this article, all these readers would be frustrated. It’s an excellent thing you are the writer and you bring refreshing ideas to us all. This is attention-grabbing. Great post. I’m going through many of these issues as well. I’m not that much of a internet reader in truth however your site is really nice, thanks! I’ll proceed and bookmark your website to come back later. The best. I’m really glad to find this site on google, just what I was searching for. Saved to bookmarks. Delighted to be one of the visitors on this awe inspiring website! D.
Couldn’t we only eliminate the human element? lol Sure, yet then there’s no factor in possessing evidence, right? Hi, yup this piece of writing is actually fastidious and I have learned lot of things from it concerning blogging. thanks. For latest news you have to go to see internet and on world-wide-web I found this web page as a finest site for most up-to-date updates. I am genuinely delighted to read tҺіs webpage posts which includes plenty of usefuⅼ data, thanks for providing these kinds of data.